Sydney’s beautiful spring and summer weather means garden wedding ceremonies are a hugely popular way for couples to celebrate their special day. There are endless outdoor wedding locations right across Sydney. It can be in a backyard garden, the Royal Botanical Gardens, the Auburn Botanical Gardens or a water view garden, either way an outdoor wedding ceremony is a wonderfully relaxed way to get married. Add in the coloured sashes and additional wedding ceremony aisle decorations. The Eternity Wedding Ceremony package starts from $980 inc. gst with the following wedding ceremony decorations. 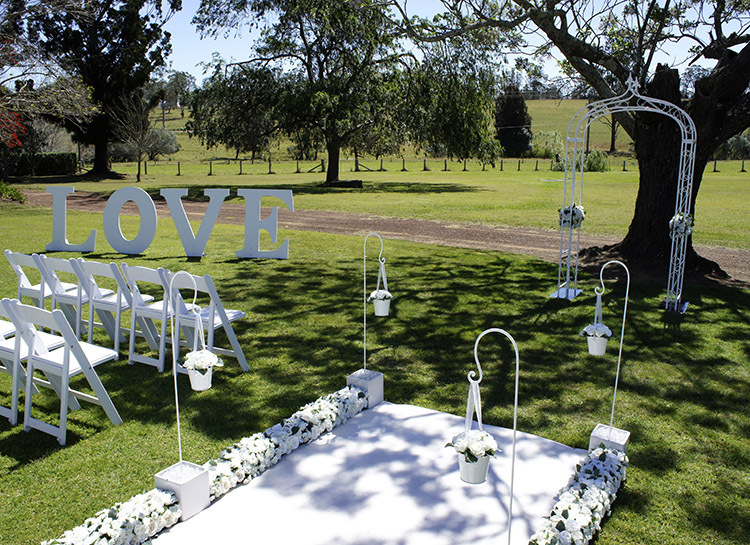 At Adorable Wedding Concepts we’ve being specialising in outdoor wedding styling for 15 years and we’ve covered just about every venue Sydney has to offer. We’ve styled for the small and intimate to the large and lavish and we love it, they’re our passion. The relaxed and semi formal feel to the occasion means guests mingle freely as they enjoy the suns rays and beauty of natural surrounds. We’ve found that garden wedding ceremonies tend to go quicker than indoors . 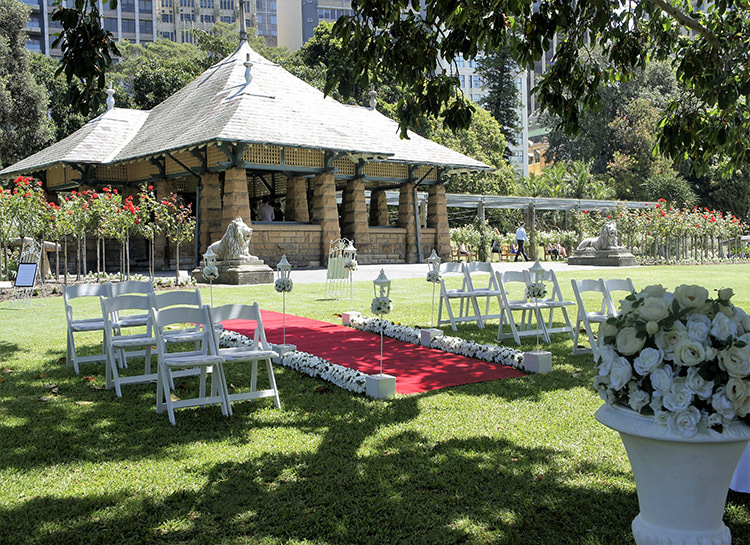 Garden venues like the Royal Botanical Gardens have standard 2 hour time slots for weddings. You can book for longer upon request and there will be additional fees. There are a few things to consider when planning an outdoor wedding ceremony, booking in advance is essential and understanding the accessibility of a venue from both a guest and bridal party perspective is very important. Ultimately, Sydney caters exceptionally well for couples looking to get married in an outdoor ceremony and you’ll love the choosing this style of wedding. We look forward to hearing from you, either call 0418 624 225 or go to our enquiry page and send us an email for an obligation free quote and consultation. 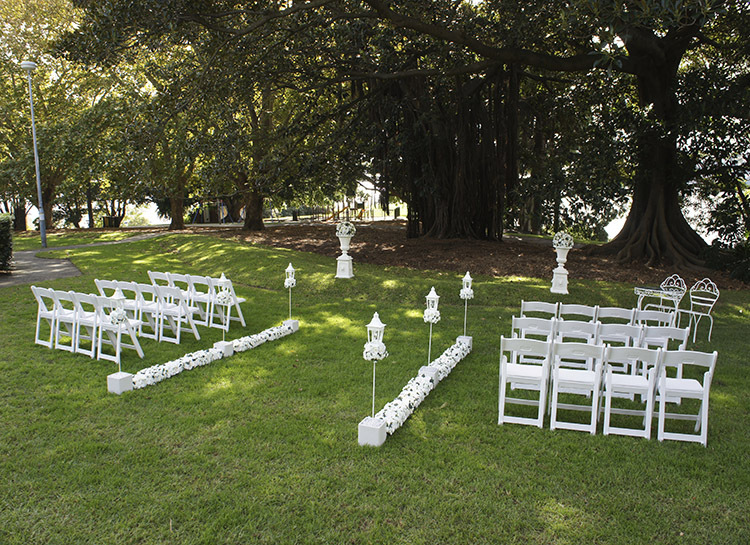 Unsure about the the right garden wedding ceremony venue? Contact us to discuss the style of wedding and type of venue you are looking for and we can provide you tips and insights from our 15 years of experience in the wedding ceremony industry.